SWANKY restaurant chain La Sala is taking dining to another level in Puerto Banus this summer… literally. 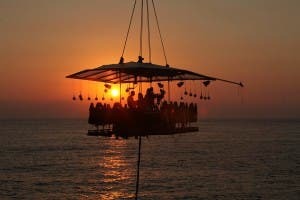 table will be hoisted up 50 metres for La Sala in the Sky. Sala Group, which already boasts a restaurant on Gibraltar’s Sunborn Yacht, teamed up with chef Aitor Perurena for this latest dizzying venture. The floating restaurant, which will be the highest viewpoint in Marbella, will have 360 degree views with a crane to lift the diners. It was inspired in connection with Dinner in the Sky, a Belgian company which has already hosted 5,000 such events across 40 cities globally including the Kuala Lumpur tower and up above Cape Town. The dining experience lasts 70 minutes and introductory offers start at €99p+IVA.